The day started quietly with a review of Facebook and emails. Later my Valentine and I went out for lunch. We rambled on over to Parrains, one of our favorite destinations, and enjoyed our food on the patio. We observed that the "over the hill crowd" had decided to celebrate the day in similar style. The springlike weather was perfect with plenty of sunshine to go around. We dined on gumbo, grilled fish and bread pudding. Yum! But alas our appetites for dinner were spoiled by the late lunch. As supper time approached, I looked around the kitchen and found nothing of interest to cook. We have long since given up on eating dinner out on Valentine Day as the crowds are too much for us. So....I had lots of eggs. I remember a recipe from long ago that I thought would be a pleaser. I would like to share it with you. I used to prepare it for my kids for breakfast when they were young. I think they liked it and I know that hubby loves it. It's Eggs a la Goldenrod. Here is the recipe and the secret ingredient revealed in this post. 2. Peel eggs while holding them under running cold water. Slice them in half long ways and scoop out the yolks. Mash the yolks with a fork and set aside. 3. Chop the egg whites into small pieces and set aside. 4. Melt the butter in a small saucepan and add the flour. Stir until smooth. 5. Pour in the milk and stir constantly over low heat until the Béchamel sauce is smooth and thick. 6. 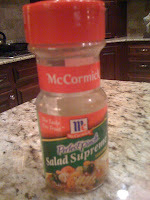 Season with salt, pepper and McCormick Salad Supreme Seasoning (secret ingredient) to taste. 7. Stir the chopped egg whites into the sauce. 8. 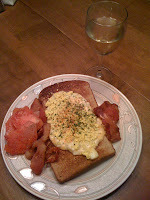 Cover two pieces of toast with 1/2 of the sauce and top with mashed egg yolks. 9. 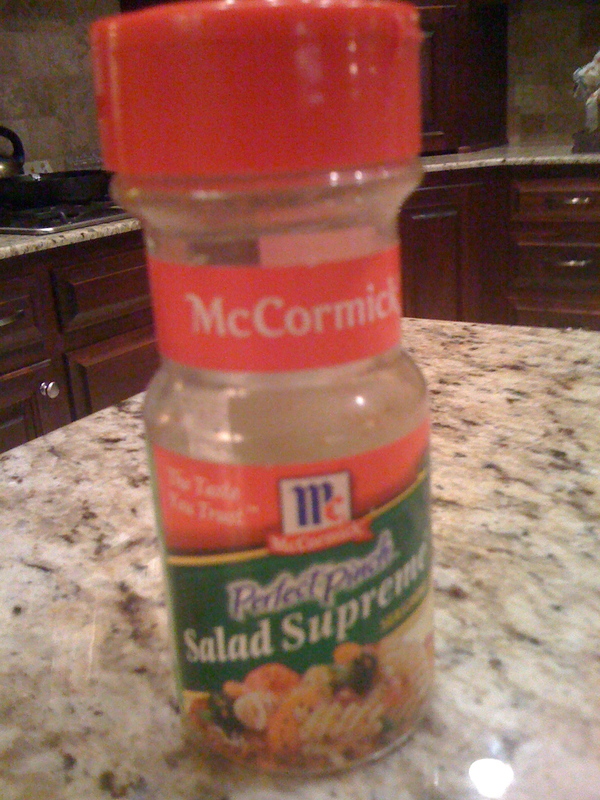 Sprinkle with parsley, Paprika and more of the McCormick Salad Supreme. Makes two generous servings. Garnish with sliced tomatoes and add some cooked bacon to the plate. Enjoy a peaceful meal without all the hustling and bustling for a table at a restaurant on Valentine evening. This pairs well with a crisp, dry white wine. Our house wine (was on sale at Sam's) is Cupcake Sauvignon Blanc. My sous chef was exhausted from her fun Valentine celebrations of yesterday and today and did not join us this evening. She enjoyed her Valentine present the most for the prettily wrapped box. It could have been empty. 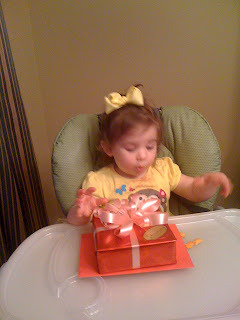 She loved the wrapping and exclaimed: "Wow" with enthusiasm.